A new range of part-turn gearboxes, the GQB series, extends the gearbox portfolio of electric actuator manufacturer AUMA. Engineered and manufactured in Germany, they have been designed to meet the requirements for basic 90° applications with standard industrial valves such as butterfly and ball valves. All components within the power drive, like the worm wheel and worm shaft, are surface hardened to increase wear resistance. In addition, all housing parts are powder-coated using AUMA’s corrosion-resistant two-layer powder coating system. 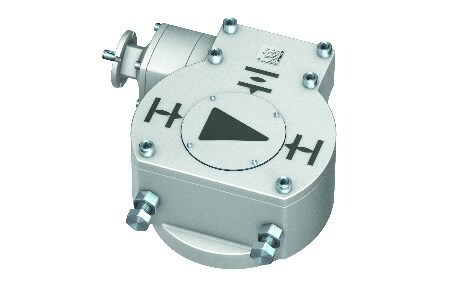 The housing incorporates a coaxial primary reduction gear as well as integral mounting flanges for the actuator, handwheel and valve. This considerably reduces the number of parts and the amount of material required, without compromising performance. End stops to limit the valve travel are easily accessible next to the output drive shaft. A patent-pending overload protection guarantees safety in case of excessive torque. The new GQB gearboxes are currently available in three sizes (GQB 160.1, GQB 200.1 and GQB 250.1), covering a torque range from 21 000 Nm to 84 000 Nm. Further sizes are expected to follow. The part-turn gearboxes can be used either in combination with an AUMA SA multi-turn actuator or with a handwheel for manual operation. A base and lever unit for ventilation flaps, for example, is also available.